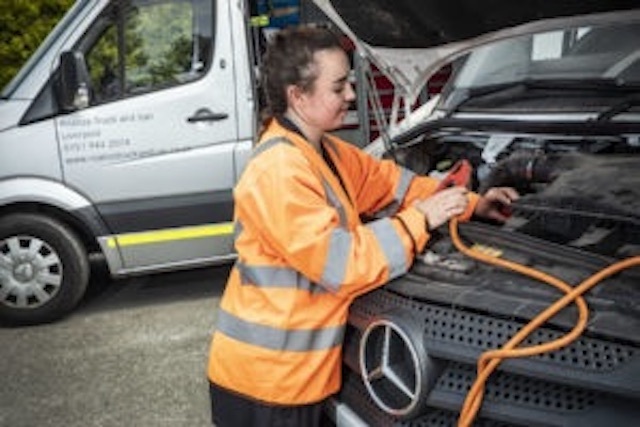 A nice story from the north-west of England – Fallon Hignett has graduated as the UK’s first female Mercedes-Benz commercial vehicle breakdown specialist. The 19-year-old from Liverpool works as a commercial vehicle technician at North-West Dealer Roanza Truck & Van. She joined the company after finishing school three years ago, earning a place on the Mercedes-Benz Apprenticeship Programme. Although her apprenticeship does not finish until October, she has already taken the next step on her career path by achieving the qualification required to become a mobile breakdown technician, joining the Service 24h team at Roanza’s branch in her home city. Fallon spent time shadowing a senior colleague before embarking on a programme of on-the-job training backed by specialised courses in roadside fault diagnosis and repair, delivered at the Mercedes-Benz UK Training Centre in Milton Keynes – and accredited by the Institute of Vehicle Recovery – to gain the Service 24h qualification. Fallon said, “I’ve always found workshop assignments interesting but dealing with vehicles at the roadside presents an extra test. I love the unpredictability of this job – you never know what you’re going to be faced with when you start a shift – and it’s nice to get out there and meet the people who drive our vehicles. Her drive to succeed has been evident since a very young age. She took up kickboxing at just seven years of age, is currently training six times a week and has a World Championship belt in the 16-18 age category in her trophy cabinet.